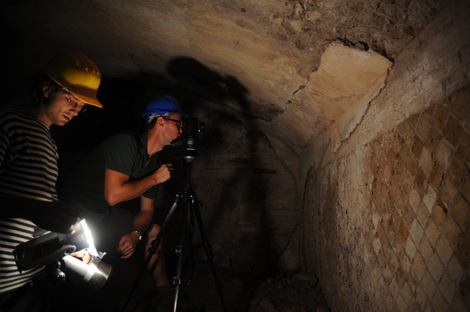 The Portus Project uses several forms of multi-spectral imaging, notably infrared and ultraviolet photography, to highlight aspects of archaeological remains that are not evident via conventional photography. For example, using infrared photography from a helicopter, team members have identified surface features in the hinterland of Portus already known from the initial geophysical survey (such as the Trajanic aqueduct), but with the addition of important new details. 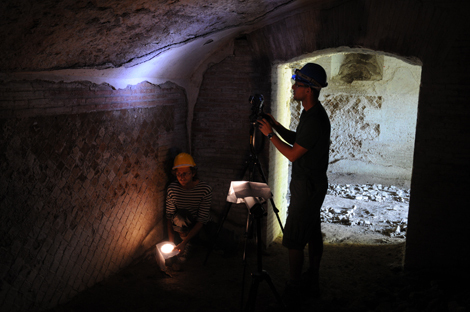 At a finer scale, the Portus Project is applying multi-spectral photographic techniques inside the surviving rooms on the ground floor of the Palazzo Imperiale to examine the remnants of ancient writing and images.